I made a trip up to the North Country with my wife in New Hampshire and got some fishing in to target salmon and trout. My goal was to catch a 5 species coldwater slam - salmon, lake trout, brown trout, rainbow trout and brook trout. I achieved 4/5, catching 9 salmon, 12 brook trout, 7 rainbow trout, and 3 brown trout . . . . I got skunked on the lake trout, and really regret not trying Second Connecticut Lake for them. That being said, it was a very good trip, and I never spent more than 2 or 3 hours fishing at a time. Most of the trout were small, in the 10" - 14" class, but I did catch two keeper salmon. For salmon, the water was warm (65 degrees), and the fishing was very technical. The salmon are only on the big lakes in this area, and I had my best luck very early in the morning trolling leadcore line with DB Smelts (a little trolling spoon). Essentially, I would try to be on the water at 7 am and fish until about 10 am during the morning. I also did short late afternoon trips to some trout ponds, which didn't produce great results because of the heat. The lodge we were staying at was on Back Lake. 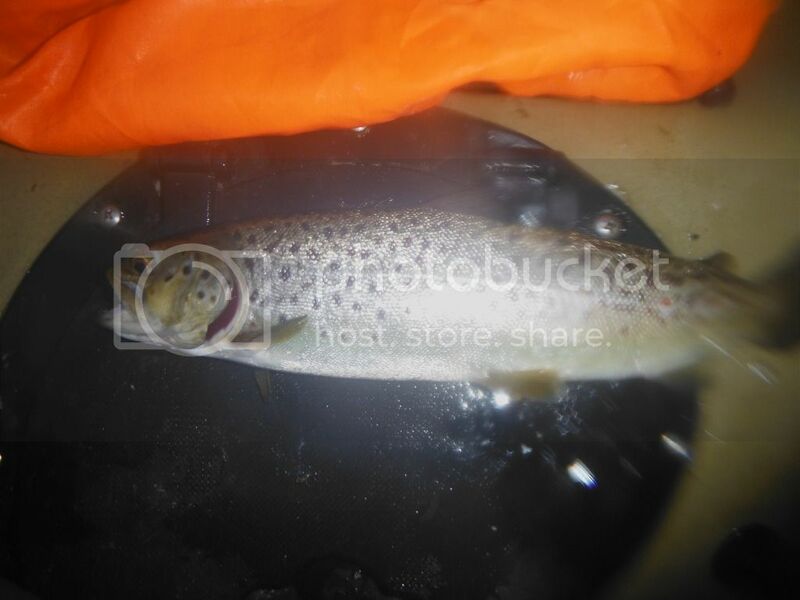 As such, the first night that I was there, I fished Back Lake, which has brook, brown, and rainbow trout. I was targeting the big brook trout in there. We arrived at around 3 pm, and I fished after we set up and got situated. I launched at around 6:45 pm and it was nice to wheel the kayak down to the lake where we were staying, but the fishing was poor. I knew it would be a tough bite when I felt the water - it felt too warm for trout. In any event, I trolled around the lake and didn't have any hits until dusk. At this time, I preceded to catch a rainbow trout and two brown trout. All three were small fish, and I got shut out on the brook trout. All fish were caught on Tazmanian Devils. This was my first day targeting salmon. I had heard that the bite had been very good on Lake Francis. The salmon had been roaming in the main lake after the flow went down on the Connecticut River and the smelt had moved out of the river after spawning. There was little spring runoff this year compared to other years, and there had been very little rain there this spring. This worked to my advantage, as a good spate pushes the salmon into the river instictively at all times of the year. I was on the water by 6:30 am and noticed two boats at a point about a mile from the launch. So, I decided to troll out there and see if anything would happen. Within ten minutes, I was almost there, trolling three rods - two conventionals with leadcore line rigged with two different bright orange DB Smelts. My other rod was a spinning rigged with a bright pink tazmanian devil. At 6:45 am, I felt the rod behind me on my right side start to jump and vibrate, and knew I had a fish on. 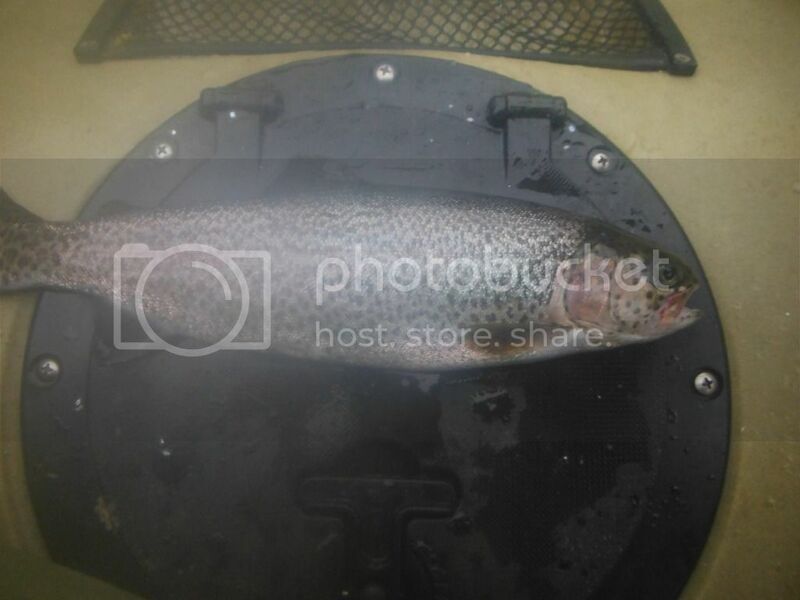 I reeled it up, hoping it was a salmon, but it was only a 14" rainbow trout, that I quickly released. So, I got all my rods back in the water again, and had my go-to leadcore line trolling at three colors and I was moving at approximately 2.5 mph - as soon as I got the line down to three colors, I had a fish on before I could even leave the rod in the holder - and I feel the line going up, and all of a sudden, I look behind me and see a fish clearing a full 4' out of the water - that was a salmon! So, I brought it in, and measured it - a nice 14" salmon. So, I reeled up all my lines, and unhooked the fish - I had my other leadcore line almost fully in, but the spoon was still dragging in the water, maybe 3' behind the boat and I feel - BAM - the rod starts shaking, and I see a fish jumping out of the water - clearing 3', and jumping 3 times in a row without stopping - I reeled in another salmon! The boat was moving at less than 1 mph - surprised to get one moving so slow and near the top of the water column, which was 62 degrees. 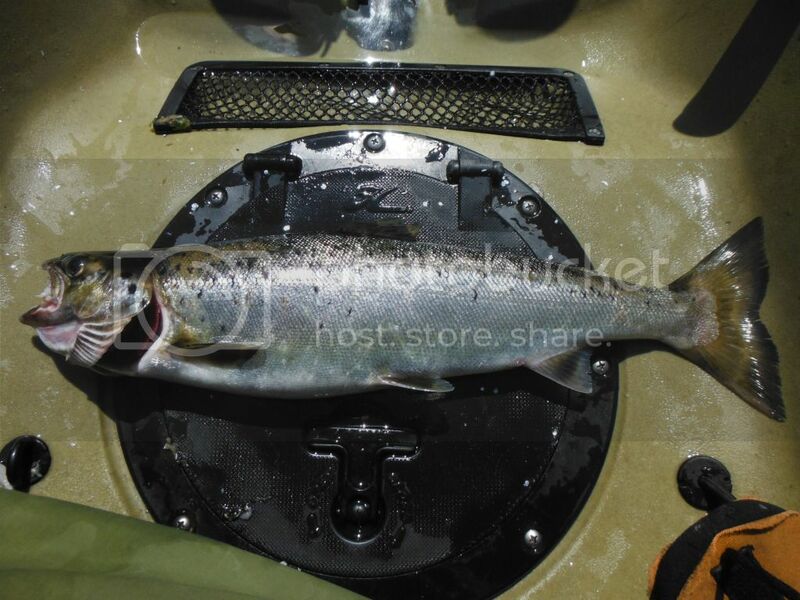 At this time, it was almost 7 am, and I already had 2 landlocked salmon and a rainbow trout. So, by now I am almost at the point and I keep trolling, and there is another point very close by - it looked like two breasts, so I started calling the point "two ****" - by the time I was at the second breast, I mean, point, I had another fish on - and it was another salmon. So, instead of moving further up the shoreline, I decided to work the "two ****" until I stopped catching fish. For the next hour, I picked away at landlocked salmon and rainbow trout . . . . but it got slower and slower, so I decided to move a little further up the shore to the next point, always staying in water between 30' and 40' and I picked up another couple of salmon. By now, it was around 8:30 am and the fishing was slowing down, so I did a little exploring. The salmon and rainbow trout were schooling together, which doesn't surprise me as they behave in a similar way in lakes. It is also important to note that as the morning progressed, the fish moved deeper and deeper and by 8:30 am, I was fishing with 5 colors of leadcore line, so I was going deep. I had no other action, and at 9:15 am, I was ready to go in. But, I decided to try the two **** one more time. By this time, I was trolling my leadcore down 7 colors, and moving at 2.5 mph. . . . . as I got into the gap between the points in 40', I got wacked hard, and I knew that I had a better salmon on . . . . . but it was down deep and took much time to get out of the depths, as soon as I got it to within 4 colors, the fish LEAPED emphatically out of the water, and it looked to jump about 5', it preceded to make several more of the same jumps as I fought it to the kayak, I fumbled with the net, but eventually got it in and landed an almost 18" salmon, which was my biggest of the day. By now, it was 9:30 am and I promised my wife I would come in, so I left. For the morning, I totalled 7 landlocked salmon to almost 18", and 2 rainbow trout. I was happy with this day, and very happy to see my first salmon since July, 2000. Late that afternoon, I fished a smaller lake called Third Connecticut Lake for lake trout, after getting a tip from the guide at the lodge. When I got to the lake, I spoke to two anglers that were trolling downriggers that told me they had caught about 7 lakers and 12 rainbows, so I was optimistic. Well, I fished from 6 pm to 7:30, totally circumnavigating the lake twice, and didn’t even get a tap, so I called it quits, and made the 20 minute ride back to the cabin. After debating trying First Connecticut Lake or Second Connecticut Lake, I decided to hold by the old axium - don't leave fish to find fish. Lake Francis is a poor lake trout fishery, although it produces some monsters livelining suckers, not too many are caught using lures. Also, I couldn't resist trying the Francis again after learning it a little bit the prior day. So, I got on the water at 6:30 am and headed towards the "two ****". Like clockwork, I had a fish on as I approached the first hump. . . . . didn't feel like a salmon, and it wasn't. A couple of minutes later, I landed a rainbow trout. So, for the next hour, I worked this area back and forth, varying my location, but not varying my speed or depth level - I was trolling at 2.5 mph and using three colors of leadcore line and caught three more rainbow trout. . . . . but no salmon. After a few more minutes, I had another fish on at three colors . . . . . and I felt the line rising up, and heard a splash, so I look behind me, and see a dramatic display of leaping from a salmon - I lowered my rod to keep it from jumping, but it didn't help. After a couple of minutes, I landed the salmon and took a picture. After this, I continued to work the area for another 45 minutes without a tap. So, I decided to explore new areas and crossed the lake (about 2 miles away) to fish the other side where I saw other boats trolling. I worked this area without any luck, and it was getting late, so I decided to troll back to the launch, but switched the lures on one of my leadcore rods from a DB Smelt to a bright pink Tazmanian Devil. It was late in the morning now, so I was trolling down with at least 5 or 6 colors of leadcore. As I worked my in, it was already 10:15 am and I had to get back to the launch, so I wasn't paying attention to my two trolling rods, and all of a sudden I hear and feel the rod with the taz shaking behind me . . . . and even better, I hear splashing and see the line rising in the air, so I turn my kayak to get a better look - and it is another salmon - at 10:30 am in the morning, which is surprisingly late! Well, this salmon had an attitude and started leaping out of the water successively, and I couldn't control it, no matter how much I lowered my rod - first it jumped on one end of the kayak, then it ran and jumped on the other side, and then it started successive jumps and I thought that I was going to lose it . . . . I got it to the boat and that was when the real fight began . I grabbed the net, and it was on the weak side of the kayak (my right side where the fishfinder is), I go to net the salmon and it moves so fast that it disappears, and I can't see it, and then it jumps clear out of the water above my head, and back into the water . . . . and then I see the line go under my kayak to the drive, and the fish is moving so fast, that I don't have time to react - not even that it was big - before I know it, my line is under my kayak - and I thought I lost it . . . . . and then WHAM! - the fish leaps out of the water from the other side, scaring the dickens out of me! Literally clearing 5' - I've never seen a fish leap like that, and I thought it was going to get tangled in my drive. . . . but I horsed him to the other side of the kayak again, and got him to go to my strong side, without having my line under the yak. So, I get him boatside, and try to net him again - and he disappears, then I see him darting around, but I can only see him when he turns because he is moving so fast . . . . eventually I get him in the net, and I am stoked, because he is another keeper and I measured him at 16" - another one for the table. After that, I headed in. My totals for the day were 2 salmon and 4 rainbow trout. I woke up to heavy winds and thunderstorms at 5 am on Tuesday, my final day, so I went back to bed until 7 am. At that time, it was still raining, but looked like it was going to stop soon, so I got up and got ready. But, I couldn't fish the big lakes with the wind and storms, so I decided to target brook trout in a lake on top of a mountain. It was a long haul up a dirt road, to an unimproved path where you could only get through with a jeep - so I followed the one lane road to an isolated little pond. I loaded up, but had to wait 90 minutes for the storm to pass before I launched. I was on the water by 8:45 am, and started trolling with two spinning rods with tazmanian devils, and a DB Smelt on one of my leadcore lines. 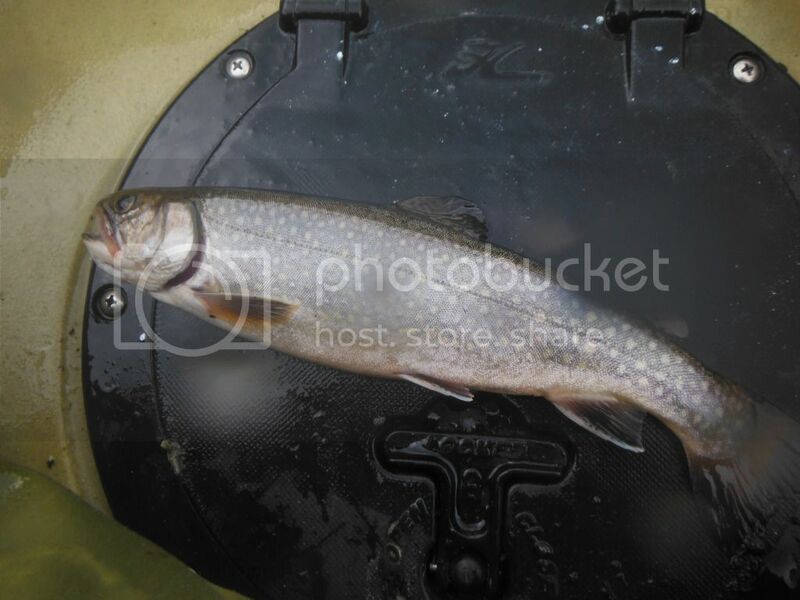 After trolling around the lake once, I felt my rod go down like it was a better fish, and I started to fight something that was heavier than some of the other fish I had caught . . . . after a few minutes, I get the fish to the boat and it is a big brook trout! It was at least 18" and 3 lbs. . . . . I got it to the side of the boat . . . . and the hook popped! Bah! That was my chance at a KW brook trout, which is a white whale in terms of size for a brook trout. Anyway, I continued to work the area for the next two hours, focusing on 15' and along the edges of the back of the lake, and picked away at 12 dink brook trout. Checkout loomed at 1 pm, so I stopped fishing at 10:15 am and headed in. The water temp was 65 degrees, which is very warm for that area.